Against the backdrop of technology trends such as cloud computing, IoT, mobile and wearable computing, crowd computing, a culture of sharing, collective computing, and swarm dynamics, this book has attempted to focus on five ideas, namely, crowd+cloud machines, extreme cooperation with smart things, scalable context-awareness, drone services for mobile crowds and social links in (mobile) crowds. We have not been exhaustive in our exploration of these areas, but we have sought to draw on current literature as well as the author’s own work, to highlight ideas not yet adequately explored and to identify synergies, links, issues and challenges. These five ideas are interlinked, though it has been convenient to discuss them separately. While they relate mainly to mobile computing, they also relate to people and devices in the non-mobile context. Social links may form taking into account the contexts of users and crowd+cloud machines developed to serve users might employ drones, which cooperate with hundreds of other smart things to work. Smart things themselves might crowdsource (to humans and other smart things) tasks that they find difficult, or cloudsource to find more resources to augment their capabilities. The label crowd-powered mobile computing and smart things may conjure up a picture of crowds of people with devices forming virtual crowd+cloud machines that cooperate on a large scale over space and time, with social links digitally formed and represented, interconnecting agents (people and things), providing value to the crowds or the things themselves. 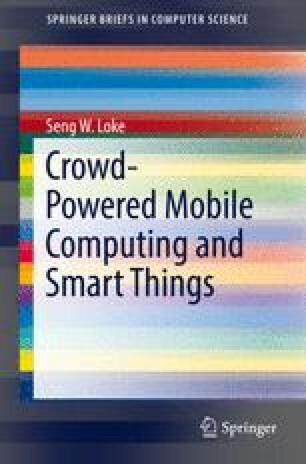 This book aimed to outline what that picture might look like in terms of current technological trends, but the future of interconnected crowds is expected to be one with a much higher density of people and things, with enormous complexity of links, and so, providing enormous possibilities.